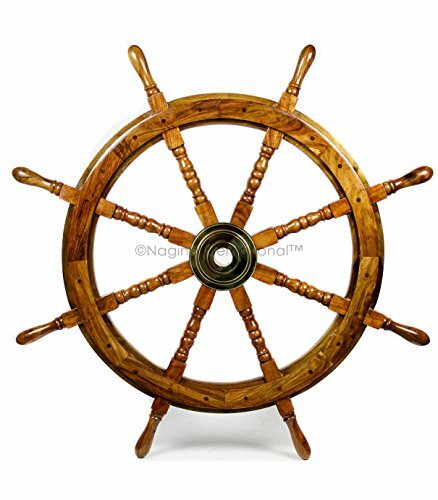 Nagina International's Nautical Hand Crafted Wooden Premium Ship's Wheel! The Exclusive pirate's decor wall accent/sculptures. The exclusive Nautical Ship's wheel range is sold solely by Nagina International and such quality shall never be found through any other vendor as the product is right out of the factory. Built of out true solid hardwood(Indian Rosewood), we bring you the best possible craftsmanship with the quality material being used in the reproductions of these beautiful Nautical Ship Wheels. Being in the Nautical Industry for several decades we have reached a point where we never compromise the quality of Nautical Ship Wheels which we offer to our customers! The Premium Nautical Ship Wheels are perfect Nautical Art Piece with quality craftsmanship and material! Built with dedication and precision by our experienced Artisans at Nagina International. The Premium Nautical Ship Wheels make great wall decor and decorative accent for Pirate's Theme Lovers! The Beautiful Hand Crafted Nautical Ship Wheels are going to leave you and your loved in a complete awe and crave for wanting one! The Nautical Ship Wheels do seem better in person as you are able to fee and grasp the quality and material! The Exclusive Nautical Wall Decor are easy to hang on a wall as the needed supplies are attached to the product itself! Wall mounting hooks and screws are supplied. The exclusive range widens from Clocks and Mirrors through Photo Frames (Photographic Frames). Keep Exploring Nagina International for impressive and lovely Decor! I'm sure you will find something for you and your loved ones! 100% Quality& Satisfaction | Return Easily & Immediately If Not Satisfied | Mounting Hardware Attached With Package | True Solid Hardwood Termite-Free Decade Laster Wood! If you have any questions about this product by Nagina International, contact us by completing and submitting the form below. If you are looking for a specif part number, please include it with your message.